The idea behind this site is to have a mix of genealogy, history, and family stories – and not just those related to the Hagenbuch family that came primarily from Montour County, PA, i.e. the William (b. 1807) and Rebecca “Muffley” Hagenbuch families. So, in line with this, we present a genealogical article on the Samuel Hagenbuch (b. 1806) and Susanna “Hess” Hagenbuch (b. 1813) family. Samuel is a brother to William Hagenbuch mentioned above. William is writer Mark Hagenbuch’s great, great grandfather which makes Samuel Mark’s great, great, great uncle. The c. 1880 photo accompanying this article was provided by Mrs. Ann Brandt of Mifflinville, PA. Ann is a long time genealogist and a 4th cousin to Mark Hagenbuch. Interestingly, Ann’s husband, Jim Brandt, is a 1st cousin once removed to Mark’s wife, Linda. Genealogists revel in making connections from one family to another! Samuel’s family line is: Andreas b. 1711 – Michael b. 1746 – Henry b. 1772 – Samuel b. 1806. He was born in Columbia County, Pennsylvania. His father, Henry Hagenbuch, and mother, Mary “Wolf” Hagenbuch, had moved to Columbia Co. in 1802. They had nine children, two of whom were Samuel and William. Samuel Hagenbuch and Susanna Hess married in 1837 and most likely inherited father Henry’s farm (located near Hidlay Church Cemetery where most of this family is buried) when he died in 1850. The farm was passed on from Samuel when he died in 1884 to his son-in-law and daughter, William and Lydia “Hagenbuch” Stahl and then to their daughter and her husband, Frank and Susan “Stahl” Harris, grandparents of Ann Brandt. Therefore, the farm purchased in 1802 by Andreas’s grandson Henry b. 1772 has stayed in the family for 6 generations. 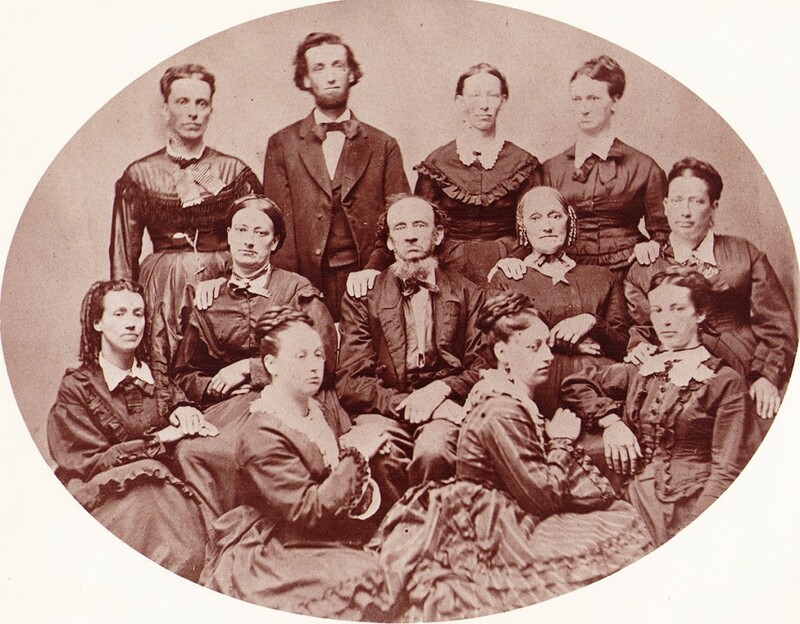 In the photo, top row left to right: Julia b. c1839 married to John Miller, Isaiah Hagenbuch b. 1845 married to Mary Mauser, Mary Margaret b. c.1842 married George Breisch, Sarah (Sally) b. c.1846 married Horace Creasy. Center row left to right: Hester b. c.1837 married twice – Charles Goodman and Jonathan Krum, Samuel Hagenbuch, Susanna “Hess” Hagenbuch, Caroline b. 1838 married Franklin Shuman. Bottom row left to right: Diana b. 1848 married Clinton Shuman, Matura b. 1856 married James Mills, Mahala b. 1854 married Harrison Brewer, and Lydia b. 1851 married William Stahl. There were actually eleven children born to Samuel and Susanna. Catherine is not pictured as she died in 1859 at seven months old. There are many descendants of the remaining ten children, some of the names still common in that area of Columbia County: Shuman, Creasy, Stahl and the Harris families. The only son, Isaiah, was born in 1845 and died in 1911. He is buried in Danville, Pennsylvania. He served in the 74th Pennsylvania Volunteer Regiment during the Civil War. He and his wife Mary had two children: Nora married to Daniel Shuman and Franklin W. who was born in 1874 and married Emma Diehl. Ann Brandt (great, great granddaughter of Samuel) has shared that Samuel never spoke English, only German; although he understood English! We take that to mean he could be a stubborn fellow. Also, he was killed in 1884 “when he fell while stepping over a tumbling bar leading from a horse-powered tread mill to a machine inside the barn which he built (perhaps in 1864?). Samuel was thrown and hit his head on the stone threshold to the second floor of the barn. He lived several days, but died without regaining consciousness.” (quote from Ann Brandt) He and his wife Susanna, who died in 1891, are buried at Hidlay Church Cemetery. Contributor Ann Brandt’s family line from Andreas is: Andreas b. 1711, Michael b. 1746, Henry b. 1772, Samuel b. 1806, Lydia b. 1851 m. William Stahl, Susan Stahl b. 1880 m. Frank Harris, Walter Harris b. 1910, Ann Harris b. 1935 m. James Brandt. To show the relationship, writer Mark Hagenbuch’s family line is: Andreas b. 1711, Michael b. 1746, Henry b. 1772, William b. 1808, Hiram b. 1847, Clarence b. 1889, Homer b. 1916, Mark b. 1953.